There appear to be two primary demographics among paintball devotees: guys with goatees and guys with earrings. The man that boarded our bus managed to fall into both categories. Big yellow hoodie, heavy paint-soaked camouflage pants—his gaunt frame propped up the baggy clothes like a wire hanger. On his head was a matted shock of hair with vestiges of former mohawk glory, and on his chin the requisite goatee. Before speaking, he scanned the 24 kids on the bus, his blue eyes like dull chunks of ice, a certain viciousness frozen in them. He looked capable of shooting someone, let alone with paint. He was an employee from Jersey Sports Paintball and he didn’t tell us his name. The first things he did tell us were the two ways we could get kicked out of his paintball arena. The first offense was removing your barrel bag outside of the field of play. A barrel bag is a little fabric sock that you sling over the paintball gun’s muzzle to contain anything that might come out—as soon as the match is over, you sheath your gun so as not to accidentally shoot anyone at close range in peacetime. The second offense was removing your mask on the field of play—it covers your entire face, and you ought to keep it on because the human eyeball does not take kindly to a paintball moving at 280 feet per second. “It looks like you threw an egg on the ground,” said Blue-Eyes. Groans of disgust emanated from the back of the bus. “It happened to my best friend.” Groans stopped short. Blue-Eyes led us, somewhat surprisingly, into a building. My only previous experience with the game of paintball had taken place in the forest: gun-toting 12-year-olds darting between trees and shooting giddily at one other for hours, in what was critically acclaimed as the best birthday party of sixth grade. I couldn’t imagine what it would be like to trap that warlike energy within the confines of a room, so my response to indoor paintball was equal parts intrigue and confusion. We walked into a small lobby that had a huge mesh screen as its left wall. That screen allowed you to look into the adjacent room: a high-ceilinged, warehouse-like expanse studded with inflatable rubber obstacles. Upon entering I was greeted by a pervasive stale odor, nauseating and somehow familiar. As Blue-Eyes explained, that was the smell of vegetable oil—the primary ingredient of the paint we were about to shoot at one another. That paint would be housed inside of spheres of thin gelatin, about the size of a marble, malleable but brittle enough to burst on impact. A paintball won’t pop when you squish it between your fingers, and it will even hold up to a certain degree of stomping, but its defenses fail when it’s fired with the force of compressed carbon dioxide. The little spheres come in a kaleidoscopic spread of colors—as I did my laundry in the aftermath, I would pick flecks of yellow, green, pink, turquoise, orange, light green, mauve, baby blue, and brown off my jeans. The paint inside is biodegradable and non-toxic and even edible, but as Blue-Eyes dutifully informed us, “it doesn’t taste good.” (The implication was that he’d taken many a paintball to the mouth.) His warning was unnecessary: at one point I held a broken paintball in my hand, and despite the way it leaked egg-like out a delicately cracked shell, I had no desire to taste the yolk. The radioactive green hue was an adequate red flag. Essentially the object of the game is to run around and fire these little spheres out of your gun so that they explode on the opposing player—anywhere on their person, be it head, torso, limbs, or weapon—thus marking them as “out.” As soon as you’re hit, you raise your hand and walk off the field, bearing the fluorescent mark of your defeat. First team to successfully splatter the entire opposition wins. 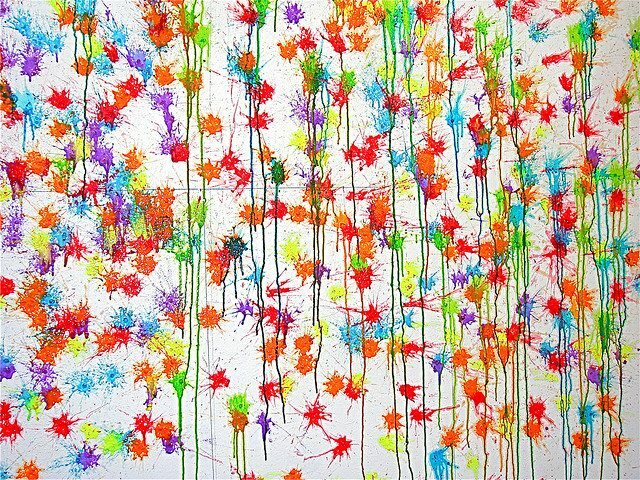 It is warfare, substituting “washable paint splash” for “bullet wound.” The teams start on opposite ends of the rectangular arena, and after the referee counts down from 10, the players can begin firing. Standing out in the open makes you vulnerable, so players tend to plunge into cover as soon the game begins, not unlike soldiers diving into bunkers. These bunkers just happen to be a bit more cuddly than most. The heat of battle cools somewhat when you realize you’re sidling up next to something that belongs in a Chuck E. Cheese’s. Made from the same material as a moon bounce, the inflatable barriers are scattered throughout the arena, cubes and cylinders and pyramids. All of them were slathered in a polychromatic paint swill, the innards of every paintball they’d deflected that day. Before we entered the arena, each player received a gun. With a slim barrel and two small handles, paintball guns are light and sleek—except for two bulbous growths, both of which are very important. One of them is the hopper, a misshapen plastic bubble perched on top of the gun that houses all the ammo and allows a new paintball to plop into the chamber as soon as the previous one is fired. The other is the CO2 tank, an unwieldy metal cylinder hanging off the back end of the handle, filled with all the compressed air that propels every paintball. Readying for our first battle, we performed all the preparatory rites. We loaded our guns with ammo, happily dumping the paintballs into our hoppers by the bagful and listening to them plop in with a satisfying gurgle. Then we let two goateed employees pipe gas into the tanks until they were full. An hour ago these 24 Princeton students were filling our bus with yawns and innocent questions—“does the paint stain? how do you load the gun?”—but they were now brandishing their firearms with confidence, pacing, anxious to start shooting one other. When it was our turn, we walked out onto the arena, a dimly lit expanse with a healthy coat of sludge. The carpet squelched with each step, saturated with the accumulated paint of thousands of paintballs. Not every round will burst after being fired, so the areas by the walls were littered with damaged and unbroken paintballs that we crushed underfoot. Walking into the dark arena, my facemask thick with the fog of my breath, I had the distinct impression that I was treading through lush new terrain, an unknown wet jungle swamp deep in industrial New Jersey, trampling some kind of unlucky fish eggs by the dozen. Each side walked to their respective sides of the rectangular arena. We had divided ourselves up into four teams, which would play two at a time: “Football” (or more precisely “ex-football,” because, as they kept reminding us, they had quit the varsity team), “ROTC”(which admittedly described only half of that team) “MAE” (students in the mechanical and aerospace engineering department), and “Rosen” (a ragtag sixsome led by professor of economics Harvey Rosen, who chaperoned us on the trip). I was pleased to find myself on the team with the people who were pursuing careers in the U.S. Army. As my new ROTC teammates casually slung terminology like “flanking” and “basic fire team,” I sat silent, blissfully ignorant, anticipating some easy victories over all the other teams who hadn’t yet taken basic combat training. There were some easy victories, but there were also some painful losses—both in the figurative, ego-bruising sense and the literal, skin-bruising sense. We played a round robin and some of the matchups were more dramatic than others. In one unfortunate round, an entire team was wiped out prematurely except for one girl, who was left to fend off the 5 hulking (ex-)football players remaining on the other side. A 1 vs. 5 faceoff is more or less futile in a game where probability is the general rule, where sheer volume of fire often wins out over any individual’s tactical brilliance. Seeing little recourse, she rushed out of cover and into the open and was promptly greeted with a fusillade of paint: all 5 opponents shot her repeatedly, as fast as they could. “I was trying to be strategic,” she later mourned. I couldn’t help but cringe because I had a very good sense of how times she had gotten hit. Our guns were semi-automatic, which means you could shoot as fast as you pulled the trigger, and even an amateur like myself found myself reeling off three or four paintballs a second. I could feel every individual shot through its reverberations—no real recoil to speak of, but a satisfying pneumatic thwunk as the ball hurtled through the barrel. With our cheap rental guns, the paintball’s path was somewhat unpredictable, always tracing out some capricious curve, which simply made us shoot more and more and more and hope that at least one of those curves would contain Point A, where Point A was the guy you were shooting at. The guns had a little metal notch on the top of the barrel that you could look through, aligning your target between the two prongs, but after struggling to hit even a stationary EXIT sign on the wall I asked Blue-Eyes if the sight was even worth using. “Just for show,” he responded, flashing an ephemeral grin. So lacking any real accuracy, we opted instead for volume. Our brand of paintball was not a particularly graceful or dynamic one. Our hit rate was infinitesimal. The poor inflatable prisms absorbed the vast majority of our paintballs. Because most of the barriers were about chest high, for adequate coverage you needed to get down on one knee, hugging the bunker as closely as possible, peeking your barrel and your head out in the hopes of catching some opponent in that very same moment of vulnerability. Sensing a lull in the enemy’s fire, you might duck your head and advance carefully from one bunker to the next in an ungainly crouch-sprint, but movement was fairly limited. Aside from the occasional foolhardy sprint out into the open (most of which ended painfully), it was a war of attrition, a slow grind that rewarded the most subtle peekers and most persistent shooters. Angles kept the game worthwhile. Always seeking out new trajectories to shoot at our enemies, some of us would lay suppressive fire while others advanced slowly up the sides, especially along one long and low bunker that snaked along the entire left side of the arena, called, appropriately, “the snake.” The team that made it made it farthest down the snake tended to win, because if you were quiet in your approach you could catch an opponent at a perpendicular angle—a tremendous strategic advantage in a game where you generally only expect to get hit from the front. Although the bunkers might have made for endless strategic possibilities, and the brochures for the arena promised exactly that, most of our games followed a similar arc: we fanned out along the width of the arena and inched forward as a group, picking off and getting picked off until one team gained a numbers advantage and could afford to get aggressive, leaving cover to rush the remaining opponent(s). Ultimately the game lacked the very specific adrenaline rush I expected from a game that imitates war: that blissful unease that sharpens all your senses, that feeling of urgency that stems from fear of enemies unseen. Most of the time I knew exactly where the enemies where; it was just a matter of hitting them and not the big bright yellow puffy pyramid in front of them. There was no disquieting silence; that was shattered by the incoherent shouts of teammates, by the unintimidating soft bubbling sound of guns firing, and the angsty nu-metal music the employees were blasting in the lobby. I never once moved faster than a modest trot and if I dropped a bead of sweat, it was because my mask was hot. Bobbing in and out of cover could only be so thrilling. The Whack-a-Mole, though noble in his persistence, is not to be envied. Fortunately I was able to get a sense of what good (or at least better) paintball looked like, because we weren’t the only people at the arena. We were joined by group of pudgy middle schoolers, many of them with earrings, though they wouldn’t have the accompanying goatee for at least another few years. After we finished a round, we would sit out for a round so the kids could play each other, and I would stand at the mesh screen and watch. Their rounds were shorter, and their methods much more cavalier—they scampered through the arena, somehow shooting much faster than we could. They more closely resembled the professional paintball players that I watched on video, who skid dramatically into bunkers as though the paint pellets were actual bullets, who crawl along the grass with serpentine ease, who stave off multiple enemies at once by popping out of cover from all conceivable angles. The increase in skill apparently does not come free. As I walked by the kids, one of them eagerly showed me the trigger on his gun, thinner and more delicate that the one on our rentals. I asked him what was special about it, and instead of pressing the trigger normally, he fluttered two fingers over it at once—you could shoot twice as fast. “Invert Trigger,” he said. “It cost me $350.” Visibly pleased, he then pointed at his friend’s weapon; price tag, $850. Guns aside, the kids were stocked with all sorts of official-looking paraphernalia: canisters of spare ammo that you strapped to your back so that you could reload your gun mid-game, intimidating sleek chrome barrels, special black apparel emblazoned with the name of paintball companies. After having played a few rounds myself, I began to enjoy watching their entertaining style of play, which was a product of their prior paintball experience, their superior gear, and the bold machismo instilled in them by owning said gear, in some unclear proportion. They would swagger off the field with their cheeks heaving, slick with sweat. At lunch they traded war stories over a pizza pie. One of them lifted up his shirt to reveal a fresh welt on his stomach, blooming red and new. By the end of our day we all had our own battle scars, and we wore them with pride. In general getting hit by a paintball is unremarkable; it hurts just enough to discourage running out in the open, but not enough for you to fear serious injury. The sensation is like getting flicked. On impact you feel sharp jolting pain that dulls and dissipates quickly enough for you to forget about it, until you spot the faint corona of a bruise in the shower afterwards. That description holds true as long as the paintball makes contact with clothing; it’s a bit different when the paintball finds bare skin. Skin can break. When I somehow got hit on the knuckle of an index finger, a cold and numb ache suffused along the bone, and as I looked down I saw a constellation of red blood specks seeping through the coat of yellow goo. It swelled up plump within minutes—had I been a lefty, I might’ve tragically lost my trigger finger. And still I could not claim to have fared worst that day. Professor Rosen, who had more than a couple decades on us, didn’t survive long in any of his rounds and consistently managed to get out in ludicrous and sad fashion. While most people shrugged off unremarkable torso shots, he endured hits to the facemask, the heart, the hip, the inner thigh. In his moment of glory he walked out of the arena, smiling sheepishly—on his scalp, right above the edge of his mask, sat a wet yellow-green splotch, glittering between wisps of gray hair as if to say, This is the proud badge of an adult who plays a game for kids based on a game for adults.